We need a minimum of 24-hours notice if you wish to cancel or reschedule your log delivery. This is because we may have already loaded our van with your order within 24 hours – and it may even be out with the driver for delivery. If you have paid for your logs with a debit or credit card and want to cancel your order we will issue a refund equal to the total cost of your order. To cancel your order or to change the delivery date please call 01691 887977 or contact us at least 24 hours before your order is due to be delivered. All our products are covered by our 100% satisfaction money back guarantee. You are also protected by distance selling regulations whereby you can order goods, receive them and review them within 14 days. However, if you are unhappy with the goods and wish to return them to us for a refund or exchange we would be grateful if you could let us know what the issues are with your order immediately so we can help rectify any problems as soon as possible. If you have simply changed your mind about your order please return the logs in their original re-saleable condition to The Log People, Maes Y Clawdd, Oswestry, SY10 8NN. If you have received the wrong items, or we have made a mistake with your order, please contact us and we will arrange collection of the goods and rectify the mistake. 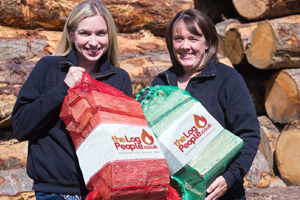 If you believe your logs are not fully seasoned and ready to burn, and you’re struggling to burn them, please get in touch so we can arrange one of our representatives to visit you and confirm the moisture content levels of your logs. If they are over 20% we will gladly replace the logs with fully seasoned ready to burn logs with a moisture content of 20% or below. If you would prefer a refund please let us know when you contact us. To discuss your order to us please contact us in the first instance so we can discuss your refund / exchange request. All goods to be returned must be in a re-saleable condition and made available for collection by The Log People on the agreed collection date. Refunds / exchanges will be processed once goods are received and checked to ensure they are in re-saleable condition. Your statutory legal rights are not affected by this policy.